Moollon is a Korean guitar maker with some interesting looking stuff. Their "Manas" models are S-types. They also do T-types and LP style bodies, as well as basses. Moollon's "Narcis" series features etched metallic looking tops, reminding one of Zemaitis - for lack of a similar comparison- although they're actually very different from Zemaitis tops after a second look. Moollon also features a Narcis S-type they built for Lyle Workman. Otherwise, they're into nice looking woods and finishes. 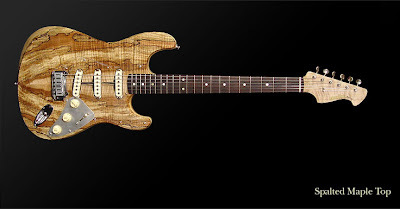 Check more pics of the Manas Spalted Maple by clicking the photo. Their specs links are currently down, so I don't have any more scoop on this. I'm not too fond of the metallic vol/tone control plate here. But obviously the clear pickguard wouldn't look good over a control cavity, and spalted wood is too delicate to accomodate body mounted controls. 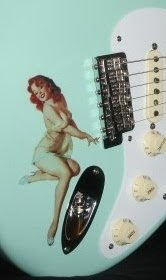 Maybe a black or cream colored plate-- something that matches the pickups.